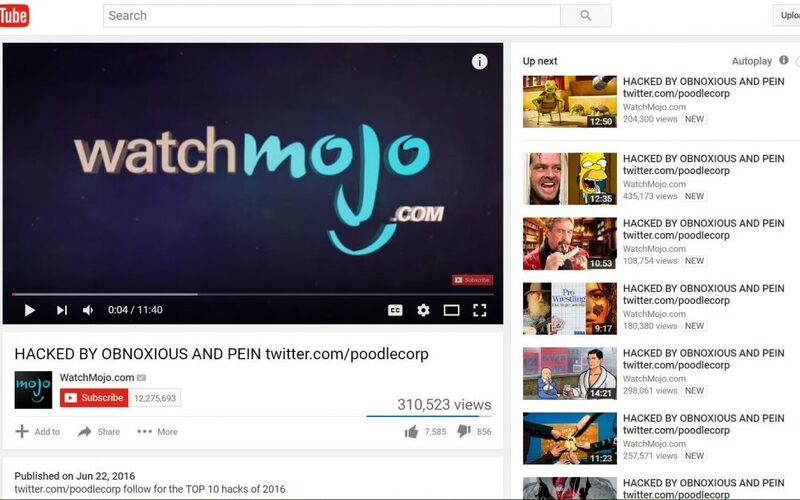 The beloved YouTube channel WatchMojo got hacked by someone calling themselves Obnoxious and Pein aka Poodle Corp. The majority of YouTube Channel’s titles on each of their videos were changed to simply “HACKED BY OBNOXIOUS AND PEIN twitter.com/poodlecorp” When following the link to the hackers twitter, you find a small amount of followers, a few tweets about the hack, and no motive to why Watchmojo has been hacked. “Long Live Poodles” is the only description for the tweeter leaving no real clues to the culprit. Watchmojo’s twitter was hacked as well for a short period of time but seems to be back under their control. Watchmojo tweeted in regards to the hack hours after. Watchmojo has over 12 million subscribers, and are known for making top ten videos about almost anything. With no statement given by the hacker, it is unclear why Watchmojo is the target. Maybe the hacker didn’t agree with one of the top ten, or this was all just an massive prank. Only thing for certain is Watchmojo has a lot of work to do.